MIAMI - A nearly stationary broad area of low pressure located about 650 miles west-southwest of the Cabo Verde Islands continues to produce disorganized showers and thunderstorms. Environmental conditions are expected to become more conducive for development, and a tropical depression could form later this week. According to the National Hurricane Center (NHC) in Miami, the disturbance is expected to begin moving west-northwestward in a day or so, and it should continue moving in that direction through the remainder of the week. 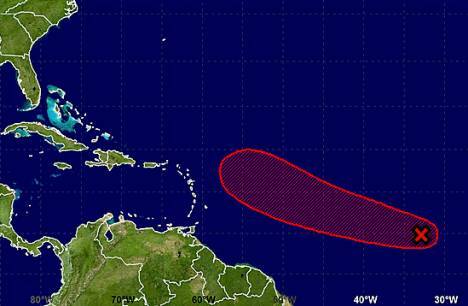 The chance of formation of a tropical cyclone within the next five days is estimated to be high (70 percent).